Six senators, including some of the president's strongest supporters in the chamber, urged him Thursday to rethink his withdrawal from Syria. President Donald Trump announced Wednesday via Twitter that he considered ISIS defeated, and multiple sources reported he had directed the Pentagon and State Department to plan for a withdrawal from Syria. The United States currently has 2,000 troops stationed in the country to support local forces with training and equipment. Trump's chairman of the Joint Chiefs of Staff and other top defense officials were caught entirely off guard by the sea change in U.S. policy, according to reports. Administration officials had recently contradicted the president's assessment. Monday, Jim Jeffrey, the Trump administration’s special envoy to Syria, told reporters the United States expected to remain in Syria to ensure ISIS remained disabled. "U.S. forces are present in the campaign to ensure the enduring defeat of ISIS. We've made significant progress recently in the campaign, and, but the job is not yet done," he said. The Tuesday before, Brett McGurk, Washington’s top diplomat in the war against the Islamic State, work was ongoing to defeat the terrorist group. "Nobody working on these issues day to day is complacent. Nobody is declaring a mission accomplished," he said at a State Department briefing. "We have defeated ISIS in Syria, my only reason for being there during the Trump Presidency," Trump tweeted Wednesday morning. By Thursday morning, the State Department was halfway through a scramble to evacuate all officials from Syria by day's end. Now, senators are encouraging the president to reverse course. Numerous lawmakers have taken to Twitter and television to go on record with their concerns, but Thursday's letter marks the most unified and direct effort to date. Sens. Tom Cotton (R., Ark. ), Lindsey Graham (R., S.C.), Marco Rubio (R., Fla.), Angus King (I, Vt.), Joni Ernst (R., Iowa) and Jeanne Shaheen (D., N.H.) all signed the letter. The senators said the abrupt withdrawal of the few American forces in Syria endangers American national security. A departure would be a "premature and costly mistake" that would allow ISIS to reconstitute its forces, improve Syrian President Bashar al-Assad's grip on the country, and empower the countries most hostile to the United States, according to the senators. Wednesday night, Trump argued in a video from the White House's south lawn that, to keep his campaign promise and honor the dead, it was time to bring the troops home. "Now we have won," he argued. The senators warned that ISIS, the putative reason for American intervention, would likely benefit from the American declaration of victory and departure. "[A]ny remnants of ISIS in Syria will surely renew and embolden their efforts in the region," they wrote. "However, ISIS is not the only threat," they wrote. They said Assad's "brutal dictatorship" would likely continue should the United States leave. Assad has presided over a bloody civil war with a death count United Nations officials place at over 400,000. Russia and Iran, two of the nations most opposed to American interests and keenest on challenging American hegemony, would solidify their foothold in the Middle East, according to the letter. 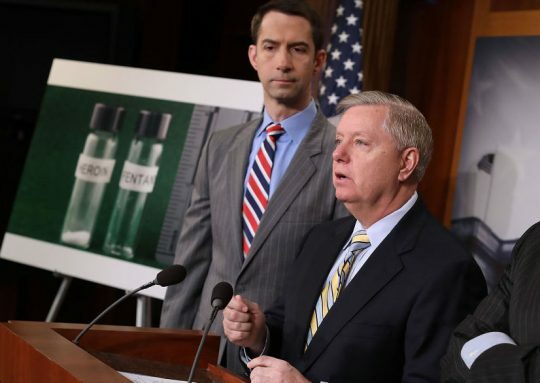 "As you are aware, both Iran and Russia have used the Syrian conflict as a stage to magnify their influence in the region," the senators wrote. "Any sign of weakness perceived by Iran or Russia will only result in their increased presence in the region." Though Russia is geographically proximate to Syria, decades had passed since it had exerted influence over Middle Eastern affairs. Prior to its incursion into Syria in late 2015, Russia had played no meaningful role in the region since the disastrous Soviet invasion of Afghanistan in 1979. But this past year, Russian mercenaries in Syria fired on American troops. Trump on Thursday referred to Russia as a "local" enemy of ISIS and said it's time for the United States to go home. Trump's decision came shortly after a call with Turkish President Recep Tayyip Erdoğan. A U.S. official credits the call with sparking the withdrawal, Reuters reported. Trump campaigned on ending America's wars and defeating ISIS. In April, Trump said clearly that he did not intend to keep U.S. forces in Syria. "I want to get out," he said. The senators hope Trump will avoid the temptations that have plagued other presidents, whether early declarations of victory or untimely (and sometimes stalled) withdrawals. "Your administration must not repeat the same mistakes that previous administrations have made and concede to these bad actors," they wrote. In a separate comment, Graham, one of Trump's closest allies in the Senate, called the move an "Obama-like mistake." This entry was posted in National Security, Politics and tagged Angus King, Donald Trump, ISIS, Jeanne Shaheen, Joni Ernst, Lindsey Graham, Marco Rubio, Recep Tayyip Erdogan, Syria, Tom Cotton, Turkey. Bookmark the permalink.